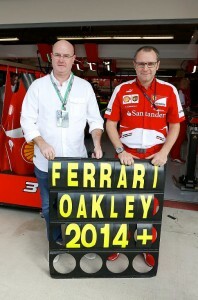 Oakley have recently announced their ‘Dream Alliance’ with Formula 1’s Scuderia Ferrari for the 2014 F1 season. This alliance brings together 2 iconic brands of their respective industries. This will be Oakley Motorsport’s biggest global partnership to date and will make Oakley the exclusive eyewear provider for Scuderia Ferrari. The partnership promises to bring technical advances, inspiration and innovation over the coming years and completes ‘the team’, since driver, Fernando Alonso, has been an Oakley team driver for the past 2 Formula 1 seasons.